The #nevertrump and #freethedelegates, as well as #delegatesunbound all, will be filing Complaints with the FEC,FBI, DOJ Civil Rights, ACLU both National and Ohio levels! These groups are looking for more, and will get as many involved as it takes! If there is one area that the mainstream media has failed in the run-up to the 2016 convention, it’s covering proposed rules changes to the Republican Party. Time and time again the media conflate that any rules change is anti-Trump and shoe horns the story into their #NeverTrump narrative. The unfortunate result is that scores of Trump supporters buy the narrative and are mistakenly upset with conservative stalwarts Senator Mike Lee, R-Utah (A, 100%) and Ken Cuccinelli. Anyone who is concerned about the lack of transparency in the Republican Party or the ever increasing centralization of power that is used to favor one candidate over another or thwart conservatives owes a debt of gratitude to these men. The rules changes conservatives sought today were not anti-Trump. In actuality they were pro-Trump’s message of not encouraging a “rigged” system and Trump supporters should be livid. The rules adopted today to increase the power of the Chairman of the Republican National Committee, lessen the voice of grassroots republicans, and further allow the establishment to rig the system. The effort to return power to the grassroots did not start today or even this year. Conservative members of the Rules committee have long tried to change rules that limit the involvement of the grassroots in the party. With a large portion of anti-establishment delegates in the hall, conservatives finally saw their chance to affect real change. They were thwarted by the establishment who convinced Trump delegates that this was an effort to steal the election from Trump. 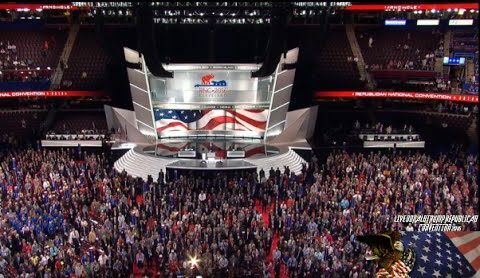 This is about decades of growing establishment power in the rules, and having an opportunity, or so we hoped to have all these – more than we’ve ever had – anti-establishment delegates in this hall – and I venture to say that if more of these Trump delegates knew the whole story they’d be voting with us. But you don’t have the opportunity to deliver that message. Over time the rules of the Republican Party have consolidated more power in the RNC Chairman and his hand-picked committee heads. This is especially true with Rule 12, which Mitt Romney allies pushed through in the 2012 convention. Rule 12 allows RNC rules to be modified by the members of the RNC rather than the quadrennial convention. This takes away significant power from the grassroots, acts as an excuse for rushing rules committee meetings, and shifts power for rulemaking away from the grassroots to the RNC itself, albeit with a high ¾ member bar. Isn’t this a convention with rules & procedures? Shouldn’t RNC have to announce which delegates and states withdrew? But while rules and procedures should be followed, the TRUMP SUPPORTERS are now acting like BLM fanatics, which is no big surprise! We hear of delegates being threatened in restrooms of injury or worse, and Conservatives being screamed down from being heard. We could mention the fact that Mike Lee’s microphone was turned off so he could not be heard. Attn: Trump supporters if you insist on nominating a liberal you’ll be responsible for another liberal in the WH! I’m standing by the Utah delegates….many of them are NOT happy with the RNC right now. We see Willie from Duck Dynasty and then Chachi from Happy days as the first two speakers. Really? Like they are someone to get political advice from? We then see Trump shamelessly bring the Mom of a Benghazi son who died to rally sympathy. We then watch two Benghazi heroes show how not to act at a convention. Really, this is fun? No this is embarrassing, not only for Trump supporters, but for Republicans, Conservatives, and the country. How many articles can a person do showing the ignorance of one man? How many ways can we discuss that Trump is as big of a divider as Barack Obama is? How many times do grassroots Christian Conservatives have to be slapped, pushed in the corner, and ignored before the true Constitutional Conservatives will stand up and fight to have a candidate that feels like we count? How many more times can we show that Trump and Clinton are nothing more than criminal liberals and neither deserves the POTUS position? How many flip-flops can one man do before his supporters realize that he is just pandering to get votes? How many stories of mistreatment of New York Vets, and women will it take? No this is not a convention with true conservatives, but more a coronation of Hillary Clinton. This is where the Nazi style Brown shirts are in full regatta, and the establishment is pushing their weight like never imagined. This is a lie in all definition and deserves not to be considered a true reflection of America, her people, the Conservatives, or even the once mighty GOP, with leaders of the past like Abe Lincoln, and Ronald Reagan. The time is upon every citizen, every voter, every free American to make a choice. Are you going to accept being told who you vote for, who you will have as President, or will you stand strong, tall, and proud? Will you fight to find not a perfect candidate, but a committed Constitutionalist to take up the baton and run for President? Will you come together, all factions from Ted Cruz supporters to Marco Rubio supporters to elect true Constitutional conservatives as POTUS and VP?